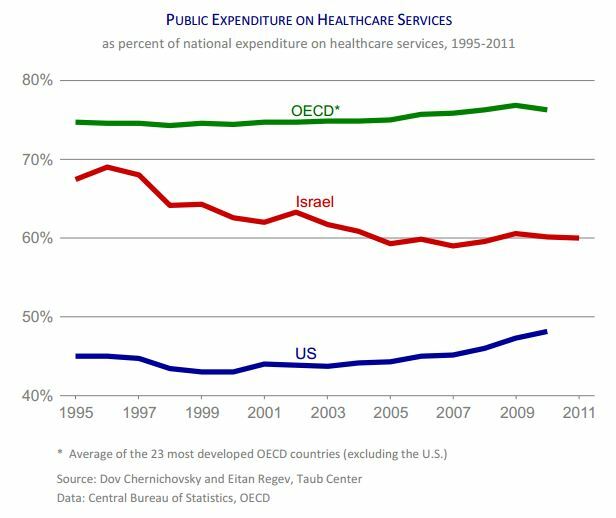 Declining public share of national health spending: The share of public funding in Israel’s total national healthcare expenditure has been steadily declining since the country’s comprehensive healthcare reform was instituted in 1995. This stands in contrast to the increase in the public funding share seen in the OECD. Consequently, Israel has been progressively moving from a situation that had been similar to the OECD towards a public healthcare funding share that is increasingly similar to the American one.